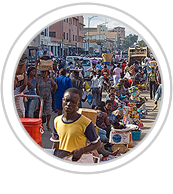 The incidence of poverty is lowest in the capital Accra at 23%. Poverty is found mainly in the rural savannah and rural forest areas, which account for 60% of total poverty in the country. Description: Accra is the capital and largest city of Ghana and it is also the capital of the Greater Accra Region and of the Accra Metropolitan District, with which it is coterminous. Cure4Hunger is charted to build more than 50 Food and Water Domes in Ghana by 2025.